I entered this world through my mother but it is in my father’s land I live and call home. A place called Round Rock, a very small community in the heart of Diné Bikeyáh (Navajoland) in northeastern Arizona. This is the place where I grew up and lived when I was small. The place of many adventures in the iconic red dirt. I spent countless days with my late Nalís at their homestead and eventually had my Kinaaldás there. My late Nalí with Round Rock in the distance. People talk about the beauty of Navajo culture being found in the matriarchal structure without distinguishing the significant role men play in our society. In the book, Blood and Voice the author discusses the differences between the two as falling with the changes which happen to both the female and male bodies. Women have their menstrual period and men’s voices change when they enter puberty. These two changes are critical to the longevity and continuance of Navajo society without women changing we would not be able to carry on the bloodline of our people. Men’s voices are necessary as they traditionally were the medicine men – they sung the songs of prayer in our ceremonies, they have the power to heal our people’s ailments. They are necessary to maintain Hozhó, the balance and harmony in our society. Turquoise is a very sacred stone to Navajo people. I was taught to wear turquoise everyday as a form of protection. 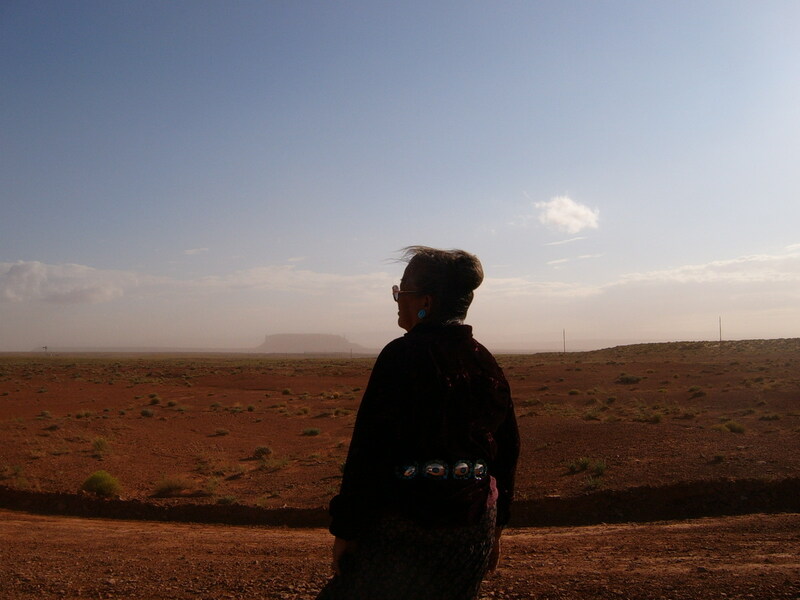 In Navajo we pray not only to Mother Earth but also to Father Sky. These beings are interdependent as we cannot have one without the other. Turquoise is worn to honor the men, to remind us we have both a male and a female side in us we must respect. I have been shaped by the men in my life as much as the women. I am a young woman who proudly calls herself a daddy’s girl. My dad is the person I turn to when my heart and spirit is broken but also when I need to be inspired or pushed harder. It was my dad who molded me during my Kinaaldás. My wit and ability to keep up with the guys’ is due impart to my brothers who incessantly tease and joke with me. Growing up I took care of them but today more and more they carry me and my spirit when I doubt my own strength. My late Cheí (maternal grandfather) was someone I only met once before his passed away suddenly, I do not remember this but my mom tells me he said I was such a beautiful baby girl. I know him only through stories and pictures but I dream about him and hope he is proud of the person I have become. My late Nalí Hastiin (paternal granddad) taught me two very important lessons with the way he lived his life – to love unconditionally and to fight. To fight for myself, my heart and my people. A quote he would recite often was, “If it is to be, it is up to me.” I love this quote and try to live my life by it as it challenges me to a sense of agency, it’s filled with civic responsibility. As part of the American Indian National Veteran Memorial at the Heard Museum, Dr. George Bluespruce notes, “As American Indian people we honor two things continuously, our elders and our veterans.” I believe we must challenge ourselves to remember daily the reasons we are able to enjoy our lives seamlessly. Our culture and society was made by the people who came before us. It is our privilege to continue this work but we must also remember and respect the people who helped build today. Tomorrow is Memorial Day, a time for us to remember not only the people who have made the ultimate sacrifice but also those who have stepped up to the call of duty to fulfill the promise of our country and to make our communities better. Like no other ethnic community American Indian people have served our country with the highest rate of servicemen and women per capita. I look around and my world has been touched by incredible men and women who have seen and understood the cost of our freedom. To my late grandfathers, uncles, aunties, brothers, sisters and dear friends who have served with humility, dedication and love, I extend my sincere gratitude for the lessons you have taught me. Your commitment can only be matched with drive to not be content with mediocrity and continuance to strive to the betterment of society. Jaclyn, this has been so beautifully written and with so much love and respect. you are a credit to your family! and I am sure that your grandma knew what a wonderful young woman you were becoming, and how much beauty and hozho you would spred throughout your life! you awre such a beautiful representative of your proud family and People! Thank you Barbara, your words mean so much! Thank you for so beautifully honoring both the male and female within us and for sharing your Navajo traditions with the world. Your blogs always inform and bless those of us who get the privilege to read them, and the world needs to listen to what you have to share. Thank you, beautiful lady! It is always important to remember our connections. A beautiful tribute and reasons why we should honor those that have come before us. The balance of past/present, male/female & earth/sky should always be present in our minds and thoughts.